You may not remember this collaboration. Originally slated to be a Red Sonja story, Claremont changed the setting from the Hyborian Age to Rome, and Bolton changed physical details of the character. Originally published by Epic Comics, a new restored edition from Titan Comics. 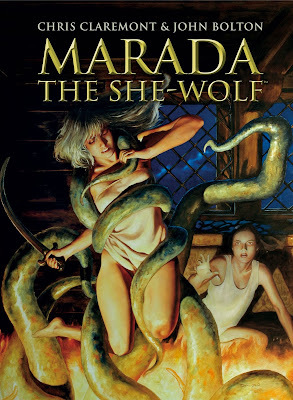 FROM X-MEN WRITER CHRIS CLAREMONT AND AWARD-WINNING ARTIST JOHN BOLTON COMES MARADA THE SHE-WOLF! Chris Claremont is one of the best-known writers currently working in comics. His work includes The Uncanny X-Men, Captain Britain, Fantastic Four and Gen13. During his 17 years as X-Men writer, Claremont co-created characters such as Rogue, Psylocke, Mystique, Emma Frost, Sabretooth, Gambit and many more! John Bolton is an award-winning comic artist and illustrator. He has collaborated with some of the industries most prestigious comic writers, such as Neil Gaiman on The Books of Magic for DC Comics, Mike Carey on God Save The Queen for Vertigo/DC Comics and Clive Barker on Hellraiser. From the world of film Bolton has worked with Robert Zemeckis, Sam Raimi and Jonathan Glazer. To keep up-to-date with news from Titan Comics, visit titan-comics.com or join us on Facebook or follow @comicstitan on Twitter. Marada The She-Wolf trailer on YouTube: http://www.youtube.com/watch?v=6eF7WNOv0HE. Titan Comics is the new venture from publishing giant, Titan, offering the best original creator-owned comics, alongside new and classic graphic novels. Launching in July 2013, Titan Comics has already captured the imaginations of readers, reviewers and retailers with its strong focus on quality, creativity and diversity of genre! To keep up-to-date with news on all these new series and future releases from Titan Comics, visit www.titan-comics.com. We here at Dorkland! managed to sit down at the (round) table with Mark Plemmons, author of the upcoming Corporia RPG that is currently being Kickstartered, for a few questions about the project. Dorkland! : Starting off with a question I often ask people running Kickstarters – how has the experience been for you, so far? Anything good? Anything bad? Any tips for aspiring Kickstarters? Mark Plemmons: So far, it’s been fun but exhausting! It’s definitely a bit like having a second job, since you have to spend time each day answering emails, working on the product, and handling other types of promotions. My main tip for aspiring Kickstarters is to complete as much as you can before the Kickstarter launches – this includes both getting the product nearly complete, and setting up all your promotional emails and contacts in advance. Gmail has a nice add-on feature called Boomerang that will let you schedule emails in advance, which is really nice for sending out press releases, so you don’t have to spend hours doing that on launch day. DL: On to Corporia, why bring Arthurian fantasy to a contemporary setting over other types of fantasy? MP: A common thread in Arthurian fantasy is that the King will return in the time of the people’s greatest need. A near-future ruled by mega-corporations where “might makes right” and the people are oppressed into wage-slavery is perfect for the return of a small group of individuals striving to bring back the knightly virtues of honor and chivalry. Of course, their return also brings back magic and monsters, which puts them in a quandary of fighting a war on two fronts and choosing moral compromises in order to make the best of a bad situation. It’s a natural fit, like peanut butter and jelly! DL: The first thing I thought about while looking over Corporia was Shadowrun. What elements of Corporia might Shadowrun fans find intriguing? What separates Corporia from Shadowrun and other games or settings like that? MP: Okay, confession time. I’ve always been more of a Cyberpunk player and, although I have some of the books and am slightly familiar with the setting, I’ve never actually played Shadowrun. That being said, I’ll answer as best I can. Both settings have magics and monsters, and as a member of the reincarnated Sir Lancelot’s secret special operations team, the Knightwatch, characters can go on ‘runs’ to retrieve relics, capture monsters, take down supernaturally-powered or mutated humans, do corporate espionage, and so on. When talking about the differences, there are a few that spring to mind. In Shadowrun, magics and monsters are common knowledge, and the city seems very grim, gray, dark, and rainy. 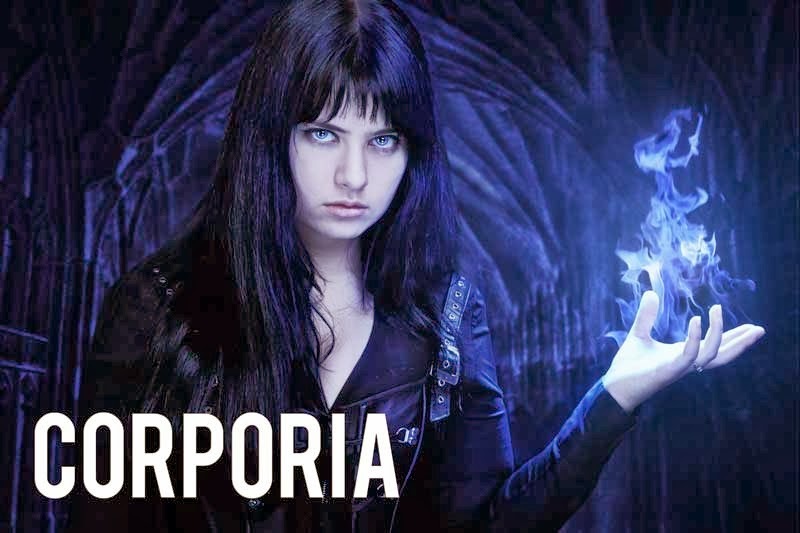 In Corporia, the corporations dismiss the magics, mutations, and monsters as cosmic radiation effects, holograms, or special effects, since they want to keep these arcane things secret until they can control them. The setting, aka “The City”, is mostly clean, white, orderly, and climate-controlled, with criminals and radicals relegated to certain districts, neighborhoods, and ‘slumburbs’ where the citizens can’t afford to pay for police protection. Except for the lack of freedoms imposed on the general population, it looks almost like a utopia. Also, Corporia focuses on human characters; there are no elves, dwarves, or gnome character types, for instance. Finally, Hackers in Corporia can bring other player characters with them when they dive into virtual worlds, so no one’s left out of the action. There may be other obvious similarities and differences, but it would take someone more familiar with Shadowrun than me to point them out. DL: A Dorklander wanted to know, did Matt Wagner’s Mage comic have any influence on Corporia? What other comics did have an influence? MP: I do know that Matt Wagner wrote a comic book called Mage, but I’m afraid that’s the extent of my knowledge. I’ve read some of his other works, but never got around to that one. The main comic book influence was Camelot 3000, a mini-series from the early 1980s, which features the Knights of the Round Table returning in the year 3000. Other comics that influenced the setting include Global Frequency, Hotwire, Stormwatch, Transmetropolitan, and V for Vendetta. DL: Using photos for the artwork is an interesting choice. What were some of the design decisions behind that? 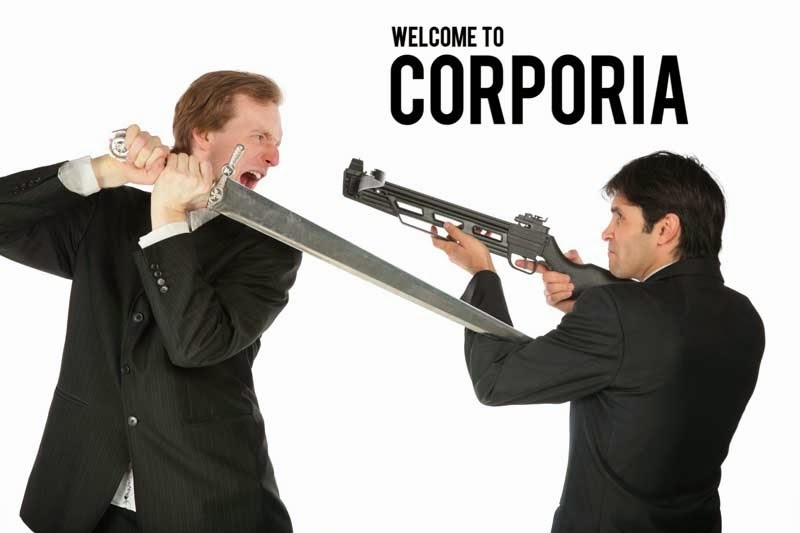 MP: I wanted Corporia to have a very modern design aesthetic throughout, and especially in the sections that are designed to look like in-game magazine articles, corporate reports, tourist guides, advertisements, and so on. Photographs fit this style well in a way that illustrations don’t, giving Corporia a very striking appearance that sets it apart from most other gaming products. DL: The photos also appear to fit in with the book and subject matter very well. How did you go about achieving this? Are any of the photos shot specifically for Corporia? MP: I spent a lot of time trying to find the websites of the very talented photographers and Photoshoppers whose work appears in Corporia. Many of the pieces were already in their portfolios and could be easily dropped into the layout, while others required some modification, either by modifying and layering two separate pieces or, particularly in the case of the illustrations and logos, often creating them from scratch. DL: One of the core mechanics of the game is to roll 2d6 and choose the highest die (with more effects based on results). Why this mechanic? MP: All player characters are powered by the Flux, which the corporations outwardly dismiss as cosmic radiation, but which is actually Chaos magic leaking from another dimension, breached when the old magics brought back the Knights of the Round Table. The player characters subconsciously manipulate this Chaos magic, allowing them an edge that non-supernaturally powered characters (who roll only 1d6) do not have. DL: The REPP stat measures the celebrity of a character and seems to be a pretty unique element of Corporia. What is it all about? Why include it in the game? MP: REPP in Corporia is a lot like the real-world Klout, a social media ranking of a person’s influence. In a world dominated by corporations, social standing and power is very important, and the REPP score gives characters a measure of where they fall on that scale. For example, it affects how an NPC corporate executive might respond to a PC’s inquiries (politely to a PC with high REPP, dismissive of a PC with low REPP), and how businesses treat high-REPP characters (such as upgrading their hotel room, giving them free gifts, or inviting them to exclusive events). It’s a particularly relevant statistic for the Lister character type (aka A-, B-, C-, or D-lister); this rock star, actor, or other celebrity can more easily infiltrate normally restricted areas, manipulate his or her fans, and so on. DL: The spell system seems to be quite open-ended with its more free-form magic. What are the strengths of the system? What should players from more traditional systems know about magic when first experimenting with this system? MP: Casting a spell is as easy as making any other ability check, and allows for a lot of creativity. The player just has to tell the Director (aka the Game Master) exactly what he wants his spell to do, and the Director sets a Target Number. Meeting or exceeding the TN means that the spell was successful. Of course, there’s a framework around this to guide players used to a more traditional system. There are four spell disciplines for the Sorcerer character type (Holography, Kinesis, Metamorph, and Technomancy) and another four for the Witcher (Charm, Elemental, Perception, and Spiritism); the more points a character has in a particular discipline, the easier it is to beat those higher TNs. The rules also describe the basics of what you can do within each spell discipline, and provide at least eight sample spells (with TNs) as a basis to start from, along with ways to easily ‘power up’ the sample spells simply by increasing the TN. DL: Lastly, what is the craziest (or coolest) use of magic in Corporia that you have thought of or seen? MP: It’s a minor little spell, but I’m really fond of Charge, a Technomancy spell that lets characters increase a battery-powered device’s charge to 100% just by touching it. I’d love to be able to do that! We here at Dorkland! 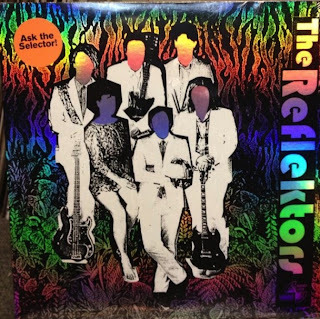 would like to thank Mark for taking the time to answer our questions and, if you like what you've read here, then you may want to check out the Kickstarter where you can learn more and flip through a preview PDF to get a feel for the product.